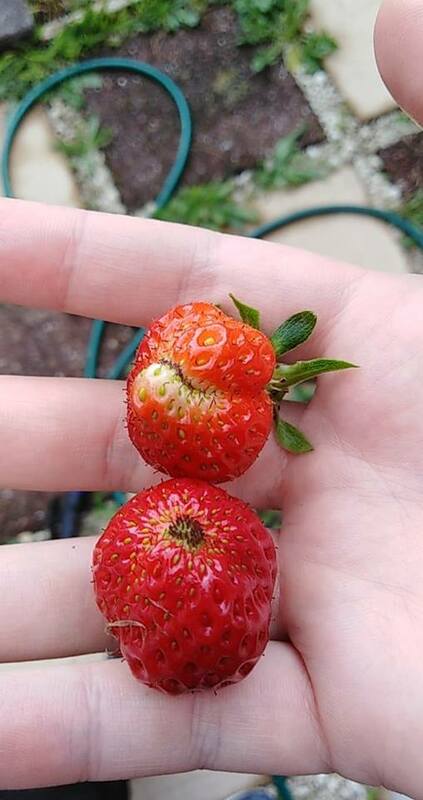 Why are the ends of my strawberries not formed properly? My strawberries have just started fruiting and they have turned red quite nicely, except that the ends seem to be this brown/black colour which hasn't gone away. They are growing in a home-made planter box (untreated timber) which is full of a mixture of top-soil and two bags of soil which was marketed towards growing strawberries. The ground is covered in straw and they get watered fairly frequently (it's raining quite a bit here at the moment despite being nearly summer). They have netting over the top of the box to prevent birds getting in and I put slug pellets down last weekend as well as spraying the leaves with Derris Dust to keep the butterflies/caterpillars off them. Any thoughts as to what might be causing this? It looks like a pollination problem. The top strawberry has zippering and the bottom strawberry is under-developed on the blossom end. Cool, humid weather and lack of valid pollination may be the cause for each fruit respectively. The humidity, the cool weather, and the inhospitable weather for insects may be the pollination inhibitors. As for the zippering, high humidity and cool weather, as well as the variety of plant, are supposed to be contributing factors. Excessive nitrogen is also said to contribute to zippering. I looked for a source about strawberry zippering, but it only gave me links about tomatoes. The same principles probably apply, though. Your fruits should still be edible, anyway. It's not caused by disease or pests. Just a wild guess, but maybe adding some phosphorous to promote stronger, healthier blooms might help the plants have a better chance at pollination. Phosphorous is said to be less available (and more needed) in cool weather. Your soil may already have plenty, though (so be careful). Excess nitrogen may be why the fruits are small, though, if they're supposed to be larger. Wet soil can contribute to higher nitrogen availability. Nitrogen can compete with potassium (and potassium is said to play a roll in fruit size, but potassium is more available in cool weather already; so, again, be careful). Not the answer you're looking for? Browse other questions tagged diagnosis strawberries or ask your own question. Why do all my strawberries become moldy? What are some tips on growing strawberries from seed? Why are my eggplant seedlings not thriving? Are large strawberries supposed to be fan-shaped? Why are strawberries cooled before planting, and what is a term for this procedure? Are these strawberries drying up? What's the best ways to keep strawberries off the ground? Why are my strawberry leaves turning brown at the tips?